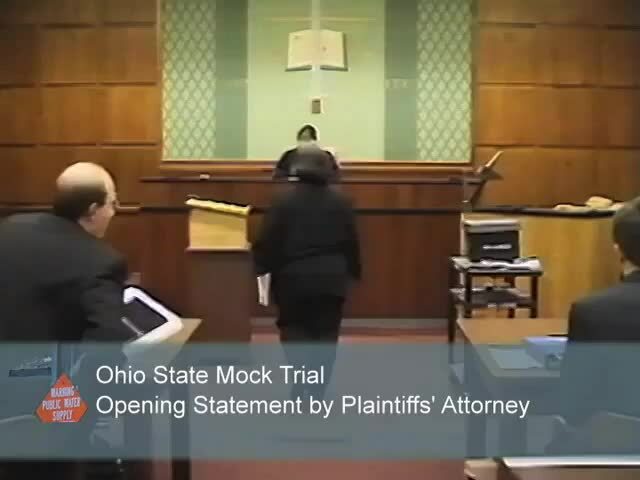 This webpage contains videoclips of several scenes in one of the mock trials held at Ohio State University. The videoclips can be viewed within the webpage or downloaded for subsequent use. 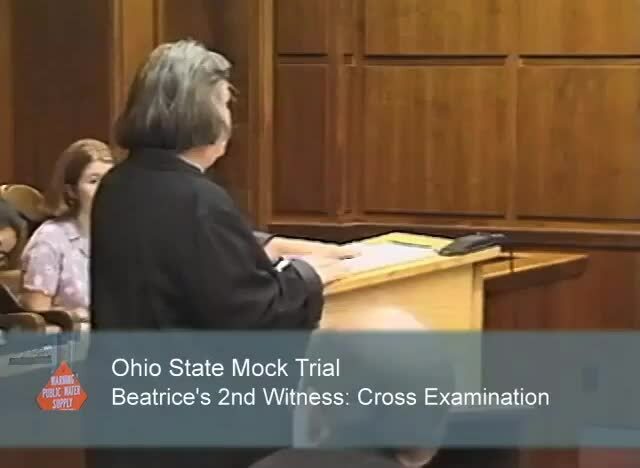 The scenes were selected to show students playing roles in various aspects of the mock trial including making opening statements, direct testimony, cross examination, use of exhibits, sidebars, closing arguments, and announcing the jury's verdict. 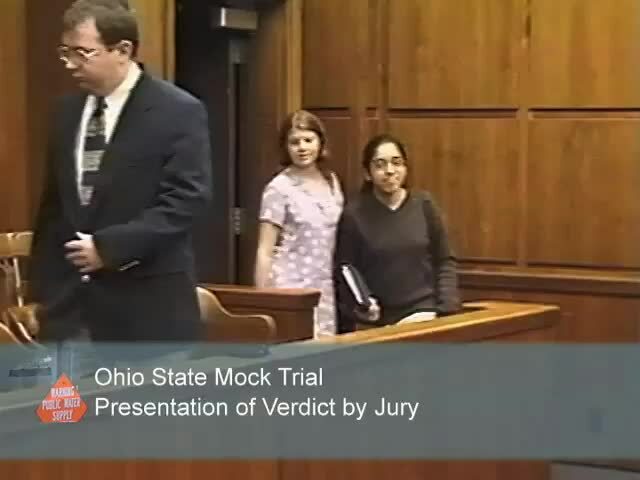 Images of students in another mock trial at Ohio State can be seen here. 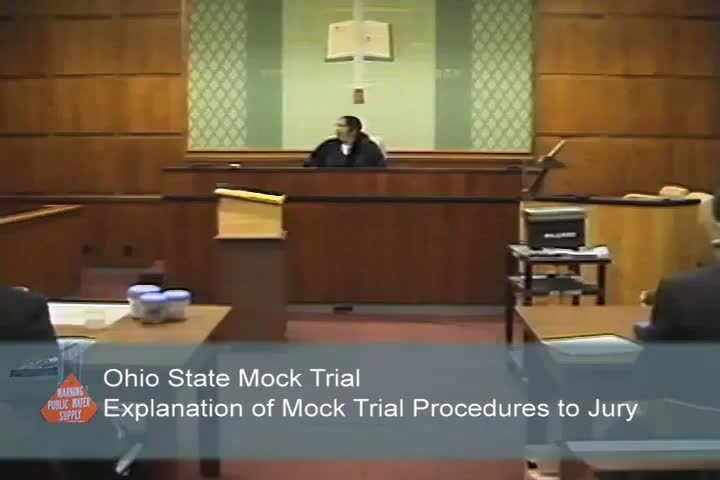 Judge's opening remarks describing to the participants and jurors what will be included in the mock trial and what materials are assumed already in evidence. The judge is played by a professor in the Moritz College of Law at Ohio State. A Quicktime (Quicktime Video 27.8MB Mar25 08) version is also available. 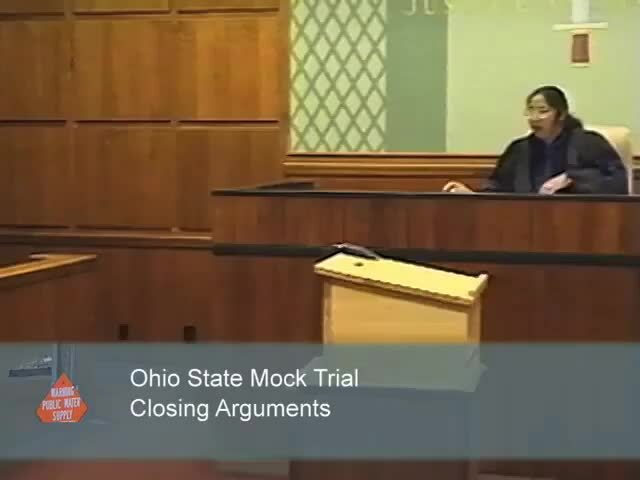 Opening statements to the jury made by one of the plaintiffs' attorneys, played by a second year law student at Ohio State. A Quicktime (Quicktime Video 31MB Mar25 08) version is also available. 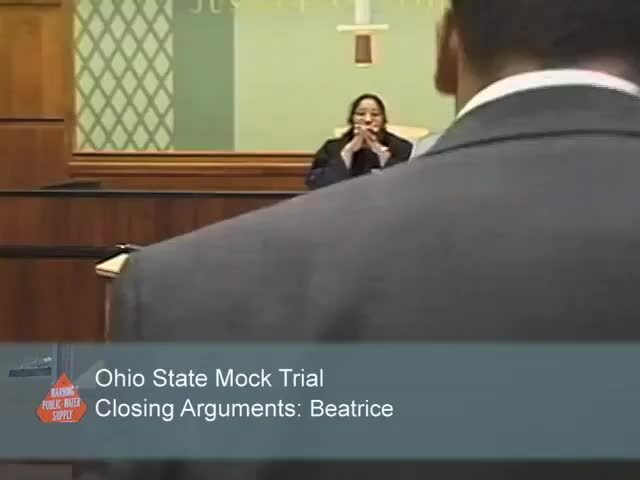 Opening statements by the Beatrice attorney, played by a second year law student. A Quicktime (Quicktime Video 20.9MB Mar25 08) version is also available. 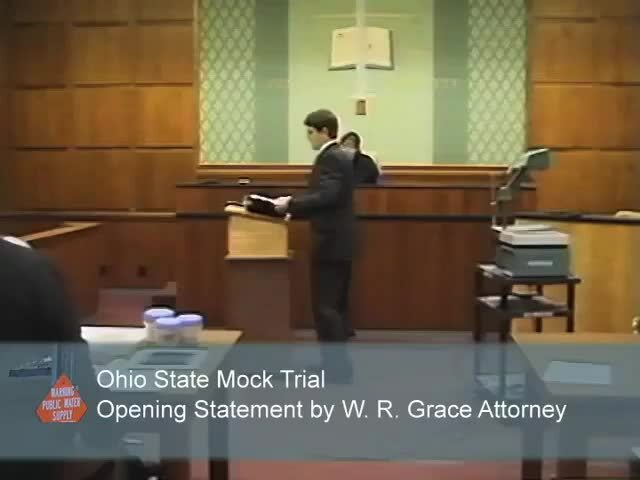 Opening statements to the jury made by the W.R. Grace attorney, played by a first year law student. A Quicktime (Quicktime Video 26.4MB Mar25 08) version is also available. 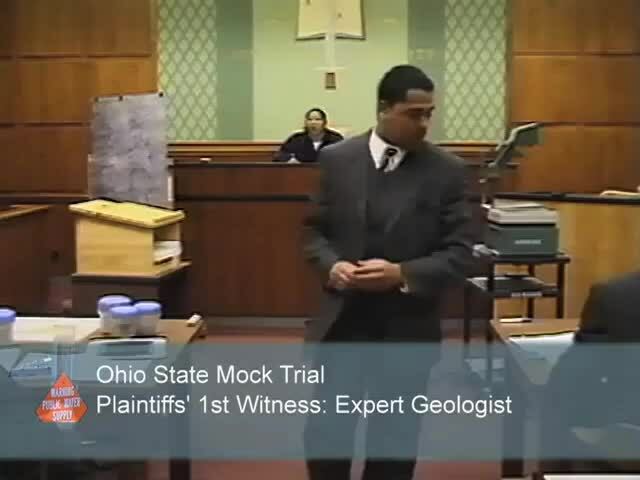 Direct testimony presented by the plaintiffs' expert geologist, played by an environmental studies major. A Quicktime (Quicktime Video 28.5MB Mar25 08) version is also available. 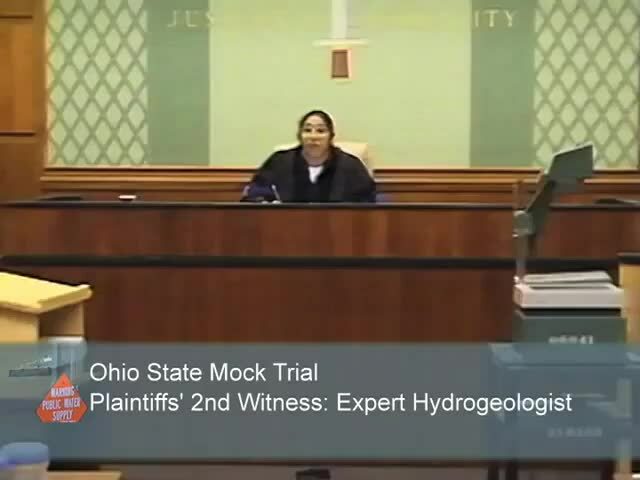 Direct testimony presented by the plaintiffs' expert hydrogeologist, played by a geology major. A Quicktime (Quicktime Video 15.2MB Mar25 08) version is also available. 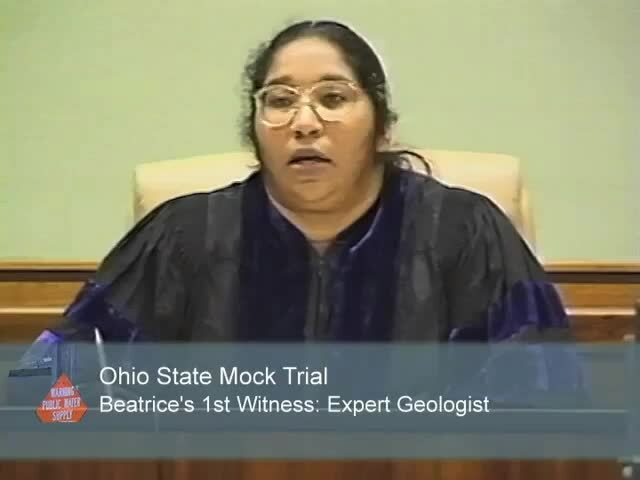 Direct testimony from the expert geologist for Beatrice, played by a geology major. A Quicktime (Quicktime Video 44.3MB Mar25 08) version is also available. Direct testimony from the Beatrice expert hydrogeologist, played by a history major. A Quicktime (Quicktime Video 8.9MB Mar28 08) version is also available. 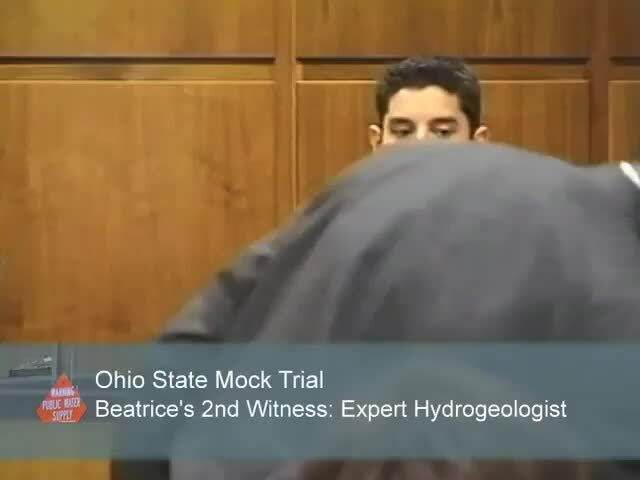 Cross examination of the Beatrice expert hydrogeologist, played by a history major. A Quicktime (Quicktime Video 9.6MB Mar28 08) version is also available. 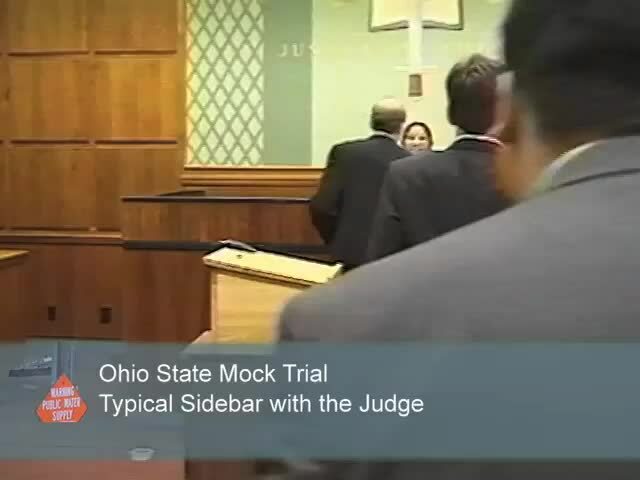 Discussion between the judge and the attorneys during a sidebar meeting. A Quicktime (Quicktime Video 5.7MB Mar25 08) version is also available. Judge's comments introducing closing arguments and presentation of closing arguments by one of the plaintiffs' attorneys. A Quicktime (Quicktime Video 41.7MB Mar25 08) version is also available. Closing arguments to the jury made by the Beatrice attorney. A Quicktime (Quicktime Video 35.1MB Mar25 08) version is also available. Announcement of the verdict by the jury. A Quicktime (Quicktime Video 10.1MB Mar25 08) version is also available. 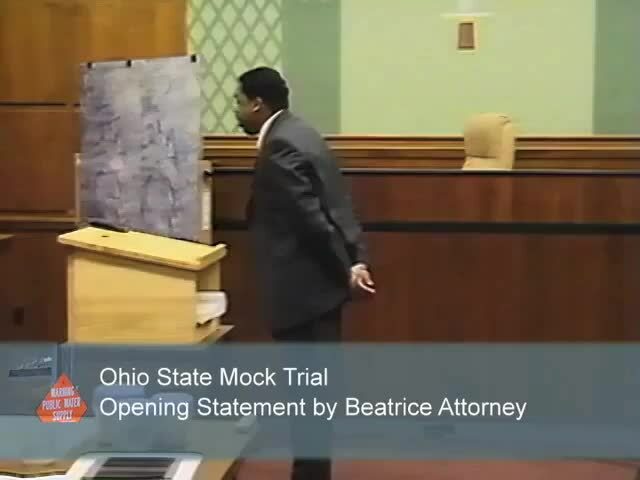 Images of students in another mock trial at Ohio State can be seen here.